With all the hope and optimism ahead in 2018, it is time to start thinking of resolutions and changes for the future. Why not look at getting a new home in the Texas Hill Country? Many homes on the market are ready for potential buyers to view and call their own. 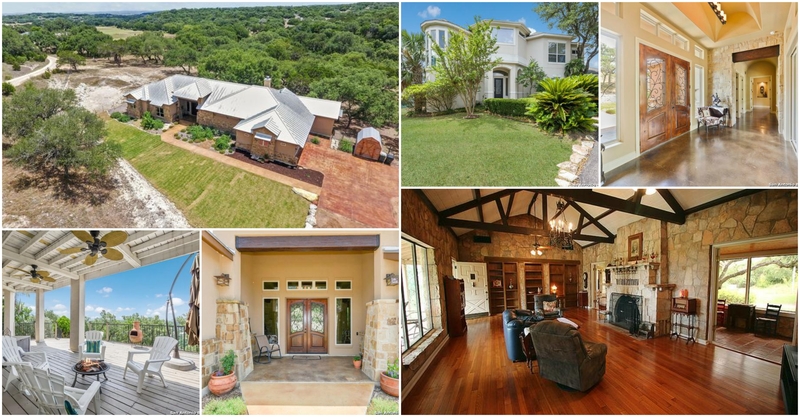 We put together a list of homes on the market right now that would be a great fit for anyone looking to move out to the wide open Hill Country! Located in the Landons Crossing neighborhood in Blanco, this luxurious home features views from one of the highest points in Blanco Country, which overlooks the river and Vaaler Creek Golf Course. Four bedrooms and three bathrooms complete this homestead sitting on ten acres. The home has many large windows that let in tons of natural light to shine on the stunning wood floors. The living room is large with a rock fireplace, and also features additional fireplaces in the sunroom and master bedroom. A maid’s quarters can be used to host the in-laws and features a stone path leading outside. This gorgeous lake view property in the Woodlands neighborhood of Canyon Lake is quite the Hill Country dream. A big outdoor fireplace and two outdoor patio areas make this place a great entertaining spot for those summer nights in Texas. The main room has an open floor plan with breakfast bar and wet bar that fits this lake house vibe. Private quarters include three bedrooms and two bathrooms with walk-in closets and wood floors in the master bedroom. This is a perfect vacation home for those weekends away or to purchase for renting out to eager lake travelers. Spring Branch is becoming the new location for New Braunfels fans who want a little bit more country in their neighborhood. This home in the Rivermont neighborhood is an excellent home for families at a great price. The master bedroom has been split in this house to make a total of four bedrooms - three downstairs and one upstairs. There is an additional living space upstairs perfect for a game room or media area, creating plenty of space for everyone. The subdivision is in a gated community, and the house is a short drive to the Guadalupe River. Want to live in the Texas Hill Country in the true, country way? Check out this gorgeous home sitting on 13.5 acres in the Rebecca Creek Ranch community of Canyon Lake. The wildlife is visible from the secluded back patio or can be seen drinking from the creek and stock pond, all on the property. Three bedrooms, three bathrooms, and a bonus powder room make up the private quarters in the house, adding to the open floor plan of the living room and modern gourmet kitchen. The wood cabinets in the kitchen are absolutely eye-catching and will be the talk of the party (when you have your first guests over!). Spring Branch lovers, keep your eyes on this stunning estate in the River Crossing community. Set on over two acres, this home is a craftsman’s finest work. The interior of the home blends rustic Hill Country staples with Mediterranean entryways, giving the home a unique flow. Giant windows look out into the dramatic landscape of the Hill Country and let in plenty of natural light to bring a warmth to the main room. A bonus hobby room and workshop with bathroom can be just what you are looking for, or you could easily convert them into a guest house. This house is for the fancy-pants-dreamer in all of us. Pull into the Rim Rock Ranch neighborhood in Bulverde and get ready to relax at this gated hilltop estate sitting on 11.5 acres. A stunning modern design of the interior with sweeping views of the Texas Hill Country could inspire the creative and be perfect for stargazing on relaxing cool nights. Entertain incoming guests in the many different living areas that you can decorate to make the flow of the house organic and light. Have friends stay the night in the detached apartment in the two-car garage. We know change is hard, and we know that buying a new house can be a pretty significant change! We would love to be a part of this decision with you. Whether it is helping you find just the right spot to build a house, walking you through the buying process, or setting you up with a lender to get you going, we are here to help! Get in touch with some of our agents today to start the process!